The Apple ProRes codec provides an unparalleled combination of multi-stream, real-time editing performance coupled with impressive image quality at reduced storage rates. In particular, the Apple ProRes codec has been designed to work especially well as high-quality, high-performance editing codec for Final Cut Pro, taking full advantage of multi-core processing and featuring fast, reduced-resolution decoding modes. And you will find the video editing tools like Final Cut Pro can't add iTunes movies successfully, for iTunes movies is protected by the DRM from the free use and transfer of digital content. So if you want to edit iTunes movies, you need to do two things. One is removing the DRM from iTunes Movie and another is converting iTunes movies to Apple ProRes. With M4V Converter Plus, you can get two things at the same time. M4V Converter Plus is devoted to removing DRM for iTunes movies purchased and rented. And M4V Converter Plus can convert iTunes movies for different players. It supports converting iTunes movies to Apple ProRes during removing DRM. You can choose Apple ProRes format such as iMovie ProRes, iDVD ProRes, Final Cut Pro ProRes, Final Cut Express ProRes and iBooks Author ProRes. Step-by-step guide to get Apple ProRes format for iTunes movies. Step 2. Add iTunes movies to M4V Converter Plus. Click Add Movies button and choose a movie listed in the popup window. Then click Add. Step 3. Choose the Apple ProRes format. Click Convert to drop-down list and choose one Apple ProRes format like Final Cut Pro ProRes as output format. After converting is done, you can find the output in the history list. 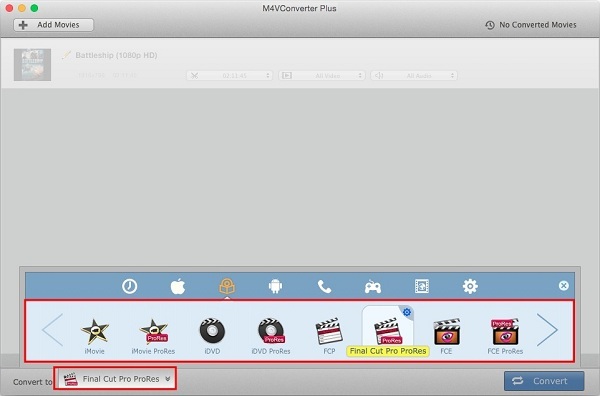 With M4V Converter Plus, you can get the iTunes movies with Apple ProRes format. You will do well with the iTunes movies outputs on video editing tools.